Local news outlet in Alaska KYUU is reporting that a tour bus which is operated by Princess Cruises has overturned in Alaska sadly killing one female cruise employee and injuring two others. The crash was reported at around 8 am Friday and only three people were in the bus at the time all working for Princess Cruises. 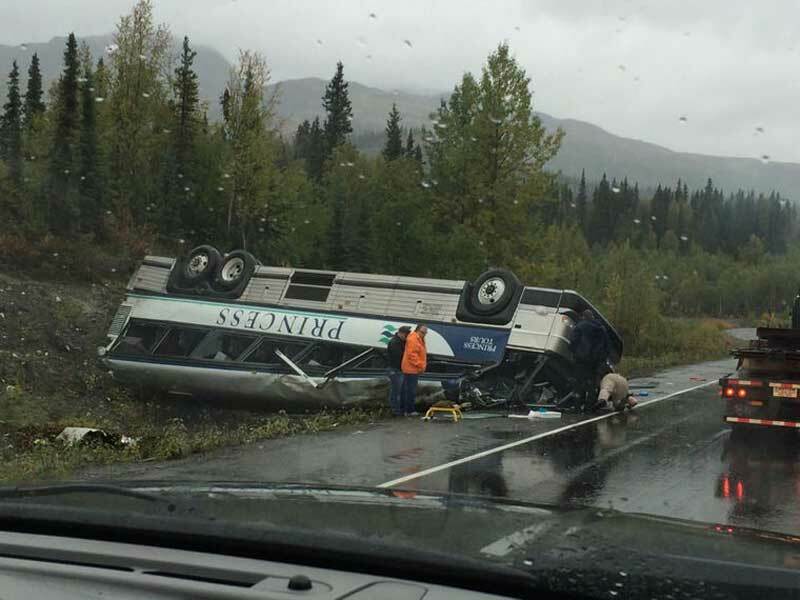 The bus apparently rolled over and ended up upside down on the side of the road near mile 173 of the Parks Highway according to Alaska State Troopers. The driver of the bus 25-year-old Brian Lanning was not seriously hurt State Troopers have said. The employee who died was 21 year old Po Ee Chong from Malaysia. The other employee was seriously injured and was Wendy Chee Shen, a 22-year-old from Taiwan. At the time the bus was not doing an excursion and thankfully was not full of passengers. This is now the second tour bus accident involving Princess Cruises. 12 people were injured on August 18th in the same region. On September 5 at approximately 8 a.m. a Princess motor coach was involved in a single vehicle accident on the Parks Highway. Two employees of the Mt. McKinley Princess Wilderness Lodge, in addition to the driver, were the only passengers onboard. It is with great sadness that we confirm one of our employees passed away at the scene. She is 21-year-old Po Ee Chong from Malaysia, and we are supporting her family during this difficult time. One other employee, Wendy Chee Shen, a 22-year-old from Taiwan, was injured and flown by helicopter to Providence Alaska Medical Center where she is recovering. The driver of the motor coach has been released from the hospital. Our CARE Team is also providing support to both these employees and their families, and our thoughts and prayers are with all those affected. We are fully cooperating with authorities to determine the cause of the accident. Princess offers lots of tours in Alaska and not just on cruise ships but on trains and even accommodation. The cruise line states as being the number one cruise operator in the region.